Home / Editor's Choice, Entertainment News, Featured Articles, Videos / Watch this racist Father discriminating black Christians inside his Church when they were taking Holy Communion (VIDEO). Watch this racist Father discriminating black Christians inside his Church when they were taking Holy Communion (VIDEO). 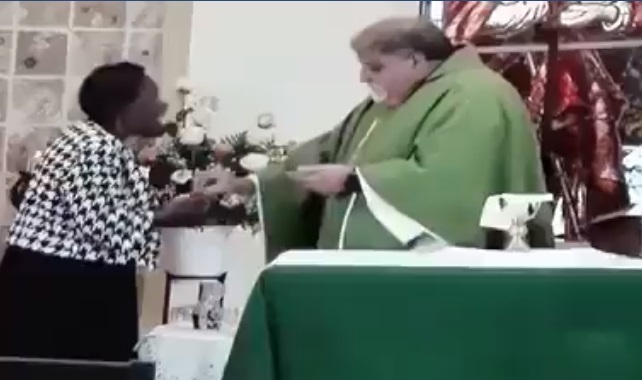 Saturday, August 25th, 2018 - This racist father was caught on camera discriminating Black Christians when they were taking the Holy Communion. Instead of treating all the Christians the same since they are equal before the eyes of God despite the skin colour, he favoured the Whites. It’s shameful to see a Man of God stoop this low. No wonder the Church has lost track these days.